Cost: $120 with home inspection. $145 without home inspection. Travel fees apply beyond 50 miles of Asheville. Recommended for all houses in all areas of Western North Carolina regardless of foundation type. Highly recommended if children, elderly or persons with a history of lung disease will be living in the home. Builder Buddy Inspectors conduct the radon tests using the RadStar RS300 Continuous Monitor device. This machine is placed in the lowest finished space in the home for 2-4 days -- it takes readings every hour and has a tamper sensor. One of the many advantages of the continuous monitors is that they produce 48-96 readings instead of just one with the charcoal/cartridge tests. The additional information is used to produce graphs that show spike or tampering events. Results are back within 3 business days.. Uranium naturally occurs underground in mountainous regions like Asheville. The Uranium breaks down into other unstable elements like Radon gas. Radon is a radioactive gas and a class A carcinogen that seeps up to the surface and into our homes where it decays and emits damaging Alpha particles. According to the Surgeon General, Radon is the second leading cause of lung cancer after smoking. Children and the elderly are especially susceptible. All homes in our region should be tested (and occasionally retested) for Radon because it is impossible to predict where these gasses escape. It doesn’t matter where in our region or what construction type (basement or crawlspace). Unless they have already been mitigated, all homes could have unsafe levels of radon. Unfortunately it is not cheap or easy to reliably test for radon. There are specific protocols and procedures when it comes to the handling, length, and placement of testing devices-- especially when it comes to real estate sales. 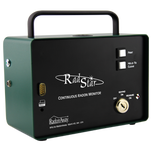 We use the Radstar Continuous Monitor-- the advantage of a continuous monitor is that it takes a reading every hour- which means that in 2 to 4 days it could produce 48-96 readings. The charcoal test only provide one reading after 2-4 days. With hourly readings, graphs can be produced and spikes and/or patterns can be observed- providing the client with more information. The Continuous Monitor is a type of Geiger counter that continuously monitors for dangerous alpha particles. Our professional equipment, protocol and test results are often used to negotiate the installation of radon mitigation equipment when average radon readings are too high. We do not install radon mitigation systems which typically cost between $1200-$1800. 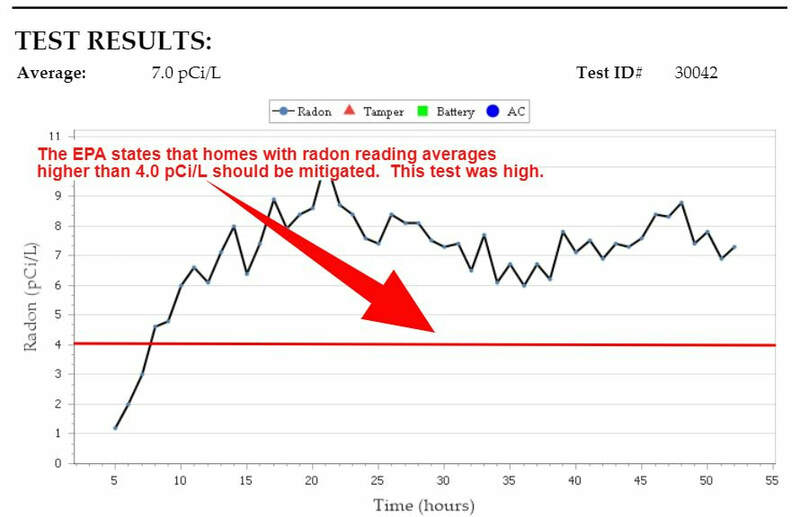 Best practice is for the home to be re-tested after mitigation-- these system typically work well in reducing radon in the home to healthy levels.